At Colorful Life Studios, taking adorable photos of your little babes is only half the experience. What we really specialize in, is decorating! I have always been a bit obsessed with decorating. Ever since I was young, I have loved arranging and then rearranging the trinkets I had in my room, and LOVED finding fun and unique wall hangings and decor at garage sales (because you know, as a kid, garage sales were totally in my budget!). Now that I'm older and have a BFA in Photography along with loads of design and art schooling under my belt, I've gotten to refine my eye quite a bit. When I decided to begin my boutique newborn and pet photography business, I was sure I wanted to be able to help my clients with not only creating beautiful images, but also helping them place all that imagery in impactful ways throughout their home. As a small business owner who works from home most of the time that I'm not working with clients, having a beautifully artful space to spend my time in is super important, as is being surrounded by images of my fur & human family. It's great when you have an exceptional portrait hanging of your loved one in a room, but when it was styled to match your decor, and printed on mediums that bring new life to your space, for me, that takes the cake! One of my favorite mediums to print on is wood, and at Colorful Life Studios, we offer several ways to get this fun display option on your walls. Printing on wood is a great approach to securing some archival and durable art for the next generation as well. Our vendor prints only on premium baltic birch wood, resulting in super vibrant colors and retaining a high quality print without sacrificing clarity. We've sourced wooden prints from multiple places, and found a vendor that has as high of a standard for print crispness and quality as we do! To allow us to decorate with wood in more of our clients' homes, we have selected a few variations on the traditional wooden print. With this versatility we can match more home styles with the artful presence of wooden artwork. Pictured here: Floating wooden print triptych. (2) 11x14" floating wooden prints, (1) 10x20" floating wooden print. By hanging these pieces without a frame, they take on a modern presence all their own. The triptych pictured above is a classic & simple wall grouping. By putting a slightly larger photo in the center, it allows the whole compilation to make a bigger statement than a single image could on it's own, and takes up about the same amount of space as one 20x30" print. Pictured here: 8x12" Framed wooden print. For people who might have a more elegant decorating style and prefer the refined look of a frame, we offer our framed wooden print. With a few frame color options, this is a great way to compliment the texture and feel of the wooden print, but still keep that classy style. 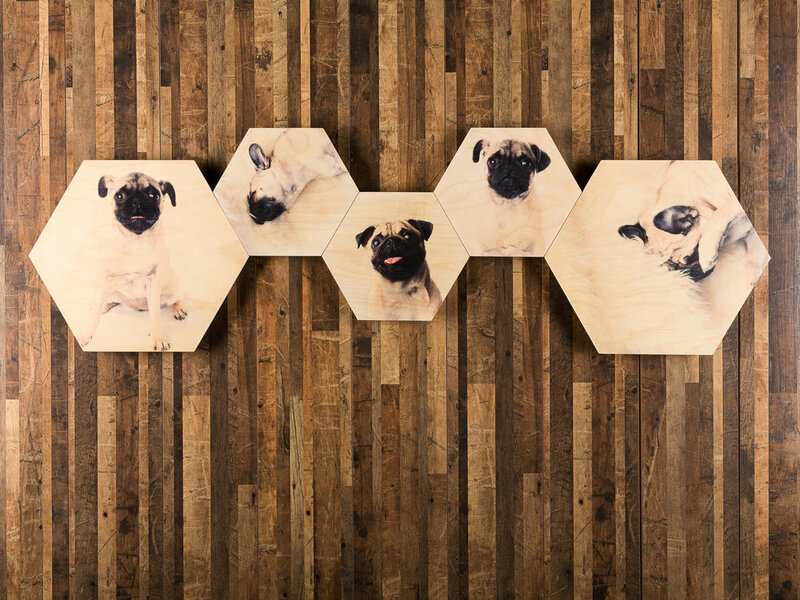 Pictured here: Hexagon wooden print triptych. (2) 12" hexagon wooden prints and (1) 8" hexagon wooden print. These are by far one of my client favorites. The wooden print has a traditional feel about it, but the hexagon shapes bring it into the modern realm! And these groupings are SO fun to design. With 2 sizes available, we can put together endless combinations of stylish wall displays! OK Tegan, this all sounds great! But how will we ever choose?! Well, luckily, you don't need to. Each portrait session comes with a session premiere, where I help walk you through the entire process of narrowing down images and selecting your favorites, and even create wall groupings ahead of time to show you what stories can be told when we carefully combine some of the best images from the session. During an in-home session premiere, I hook up my laptop to any large screen television and show you variations of curated artwork before even placing an order. You don't need to thumb through online galleries endlessly and wonder if you are making good choices. I can snap a quick photo of your wall and show you what they could look like adorned with your milestone images. It makes ordering wall art foolproof & fun. I also offer custom installs for larger wall groupings, making sure everything looks great from start to finish to create a stunning art display. Do these products get you excited?! If so, leave some comments below or head over to my contact page and let me know you're interested in setting up a session! While we adore wooden prints, there are other stylistic options that we offer for decorating your walls, including printing on metal, torn edge prints mounted in reclaimed barn wood frames, or vintage hanging canvas posters. Albums and tabletop displays are also our jam, so check out our product page to see some more of what we have to offer.